Be the first to share your favorite memory, photo or story of Dicy . This memorial page is dedicated for family, friends and future generations to celebrate the life of their loved one. 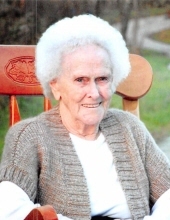 Dicy McWhorter was born November 1, 1922 in Clay County, Kentucky and departed this life Friday January 25, 2019 in Annville, Ky. being 96 years of age. She was the daughter of the late George and Sara (Ferguson) Browning. Dicy is survived by one daughter, Mary Sester and her husband Doug of London,Ky. also a daughter in law Lillie McWhorter if Connersville, Ind.. Dicy is also survived by seven grandchildren, Donna Carter, Tyner, Ky., Jerry McWhorter, Norwood, Ohio, Connie Baldwin, Tyner, Ky., Michelle Holland, Manchester, Ky., Lisa Bishop, Booneville, Ky., Lyndon McWhorter, Tyner, Ky. and Andrew Sester of Annville, Ky. and by ten grandchildren and seven great grandchildren. Other than her parents Dicy was preceded in death by her husband James P. McWhorter and by two sons Kenneth and Harold McWhorter and by ten siblings, Victor, Willie, Charlie, Jesse and Delbert Browning, Rosie Hopper, Sofie Hornsby, Cora Browning, Edna Coffey and Bessie Hail and by one great grandchild, Jesse Metcalf. Dicy was a member of the Union Baptist Church. Funeral services for Dicy McWhorter were held Sunday January 27, 2019 at the Lakes Funeral Home with Bro. Bobby Burchette officiating with burial in the Halcomb Memorial Cemetery. PALLBEARERS: Randy Vickers, Andrew Vaughn, Miguel Coffey, Shawn Smith, Austin Baldwin, James Bowles, Clarence Bowles and Gary Tincher. Lakes Funeral Home in charge of the arrangments. "Email Address" would like to share the life celebration of Dicy McWhorter. Click on the "link" to go to share a favorite memory or leave a condolence message for the family.